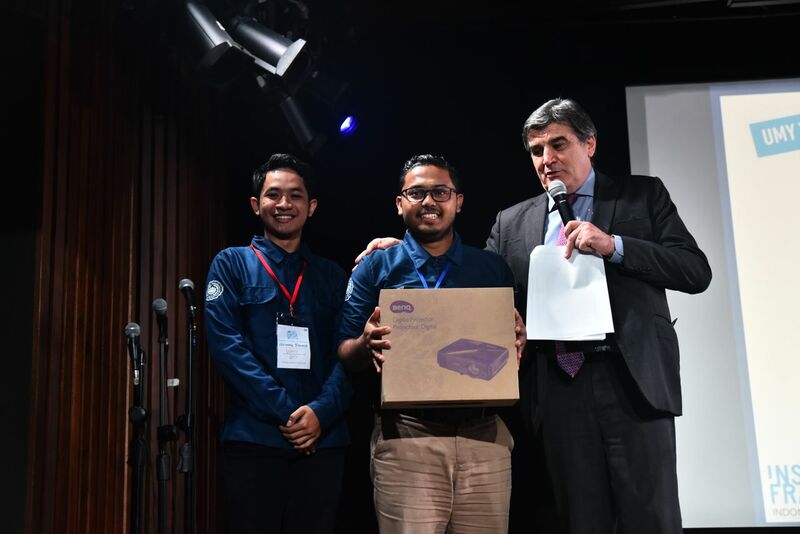 Warung Prancis (WP) of Universitas Muhammadiyah Yogyakarta (UMY) achieved WP de l’année (the best WP) 2018 from the Institut Français d’Indonésie (IFI) Jakarta. The WP of UMY also gained the award in 2015. The award was given in a seminar of Warung Prancis attended by 22 directors of Warung Prancis in Indonesian universities. A press releases on Thursday (9/8) mentioned that the WP UMY obtained the award due to various programs conducted for a recent year. “Warung Prancis of UMY always seeks to arrange attractive programs. For instance, we use a term of menu for our programs at the Warung Prancis since there must be a menu at a ‘warung’ (a food stall),” explained Director of Warung Prancis of UMY Puthut Ardianto, M.Pd. The Warung Prancis of UMY has a special menu, namely Entrée, Plat Pricipal and Dessert. The Warung Prancis of UMY sent two delegates at the seminar organized on 9-10 July 2018 at IFI building, Puthut Ardianto, M.Pd. and Whiby Tirta Ardianto. The seminar was opened by Director IFI Marc Piton and a counselor of Cooperation and Culture of the French Embassy in Indonesia. In the opening, Marc Piton thanked all directors of the Warung Prancis for promoting France to universities in Indonesia. Besides giving an award, a schedule of the seminar comprised of FGD, a presentation of Warung Prancis, a presentation on education in France, a presentation of French alumni networking, training of the use of Culturethèque, Ifcinéma, and social media for the directors to manage Warung Prancis as standards determined by IFI. The seminar was also a forum for all Warung Prancis in Indonesia to share and broaden networking. “Achieving the best Warung Prancis in Indonesia since 2015, we hope that we can enhance our creativity in conducting weekly and annual programs. We also would like to be more valuable for others, particularly dealing with introducing French culture and language,” declared Puthut.